Rule #1: Do not get so loaded at the after prom party that you accidentally-on-purpose end up in the broom closet with the surprise hottie of the evening, the class chess champ who’s somewhere lost his bottle-cap lenses and undergone an extreme makeover, especially if that makeover has anything to do with becoming one of the undead. Having survived super spy club training, Gina, Bobby and their fanged friends are sent on their first mission—undercover at a New York high school where some seriously weird stuff is going down. As excited as Gina is to get out of spook central, she’s less than impressed with her new identity as goth-girl Geneva Belfry. No color palette to speak of; more chains than a bike rack; and don’t even get her started on the shoes. About the only thing she can say for her all-black wardrobe is that it’s great for hiding blood spatter and other fashion faux pas. With the Ghouligans in town, we can’t stay in Salem. But with a supernatural strangler running loose, we can’t leave. After figuring out the Feds like to perform mad experiments on vamps for fun and profit, I decided it was time for me—Gina Covello, fashionista of the fanged—and my minions to ditch our government spy jobs. Unfortunately, that made us public enemies number one through six. Being on the run from the Feds and the fangs alike is no picnic, and who knew our perfect hiding place would be crawling with ghosts? The nasty spirit of infamous Sheriff Corwin from ye old witch trial days is on a killing spree. And with a reporter from the ghost hunting reality show Ghouligans ready to blow our vamp cover, Salem isn’t helping us blend in. But the supernatural strangler needs to be stopped. Sure, I rose from the dead, but this evil ghost’s victims won’t be as lucky . 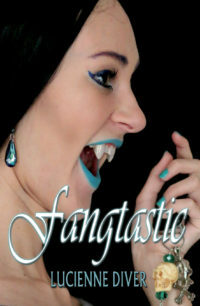 . . or as fangtabulous as me.